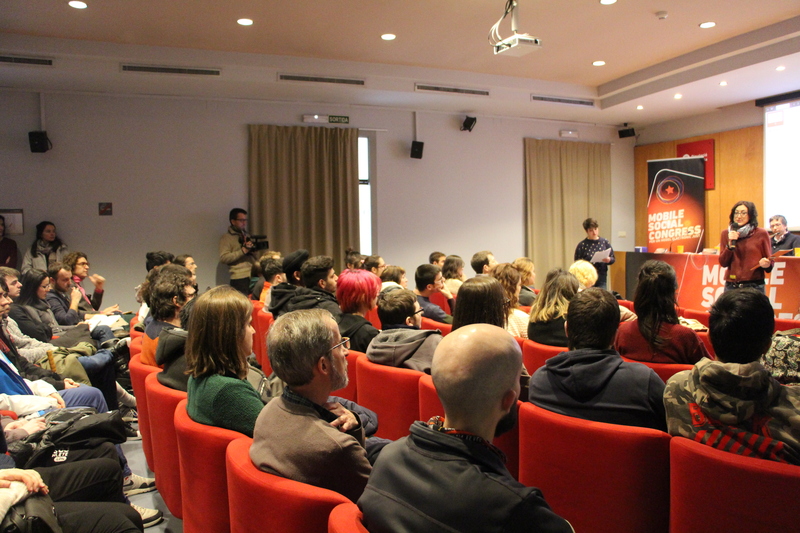 On Wednesday, the third edition of the Mobile Social Congress concluded at Pati Manning. This Congress, organized by SETEM Catalunya on February 27 and 28 with the collaboration of over 30 local and international organizations and initiatives, seeks to reflect on the current model for the production and consumption of computer and communications technologies. This model has serious social and environmental effects that are mostly silenced by the Mobile World Congress. The Congress placed the spotlight on technological sovereignty from a feminist perspective. As a matter of fact, most of the round table discussions that took place were focused on the role of women in multiple facets of the technological industry. “Over 500 individuals attended the Congress in person or via streaming, and most were women. This fact stands in stark contrast with how women are often made invisible in the world of technology” notes Laia Fargas Fursa, one of the organizers of the Mobile Social Congress. The main round table discussions included a feminist point of view. On the one hand, on Tuesday the 27th participants debated on the role of women in the use and transformation of technological tools and promoting technological sovereignty with a gender-based perspective. This discussion included Núria Alonso from the Colectic cooperative, SpiderAlex from Dones Tech, and Sílvia Pérez from the HackDones BCN collective. “As women, we constantly use technology and we need to take control and feel comfortable in technological environments. We need to destroy the gender gap in this area”, states Núria Alonso, a member of Colectic. On Wednesday the 28th, another round table discussion focused on the impact of mining on indigenous communities, especially on women. The debate included Gloria Chicaizo and Margarita Aquino, from the Latin American Network of Women Defending Social and Environmental Rights. “Mining companies are literally invading much of Latin America and generating environmental violence, especially against women. It’s important that we keep up local resistance and that we find support to gain international legitimacy”, declares Gloria Chicaiza. “As women, we know that when we lose control of our territory, we also lose our sovereignty”, she adds. The Mobile Social Congress focused on the effects generated by the use of toxic chemicals in the electronics supply chain. The Congress’ final round table discussion was focused on this subject, and included Americans Amanda Hawes, from the International Campaign for Responsible Technology, and Heather White, co-director of the documentary “Complicit”, which reveals the exploitation Chinese workers are subjected to when manufacturing our mobile phones and other electronic devices. The documentary was shown on Monday at Zumzeig cinema as a lead-up to the Congress. “Just because some chemicals are legal in the electronics industry doesn’t mean that they’re safe. It’s been proven that they cause abortions and birth defects”, states Amanda Hawes. On Monday, SETEM Catalunya activists had already denounced the use of these toxic chemicals at the opening of the Mobile World Congress, with a protest against the poisoning of workers in the mobile phone industry, demanding that electronics companies guarantee their safety. The MSC also provided a voice for the social and solidarity economy’s answer to programmed obsolescence and the recycling of electronic products. “The single-use model gets us nowhere. It’s important that we generate alternatives to extend the life of our electronic products and that we bring an end to illegal recycling circuits. Only 20% of mobile phones are correctly recycled”, notes David Franquesa of eReuse.org. In addition to roundtable discussions, the congress on fair electronics included a series of workshops and expositions. One focused on the iSlaveat10 campaign on the 10 years of modern slavery faced by those manufacturing iPhones at Foxconn in China. SETEM Catalunya also protested the denial of visa to two activists from the Congo, Sylvie Luzala and Erick Kambale, who were to take part in the Mobile Social Congress as part of a workshop directed by researcher Josep Maria Royo from the UAB’s School for a Culture of Peace. This workshop explained the mobile phone industry’s role in the warfare, violence and violation of human rights in the Democratic Republic of the Congo.